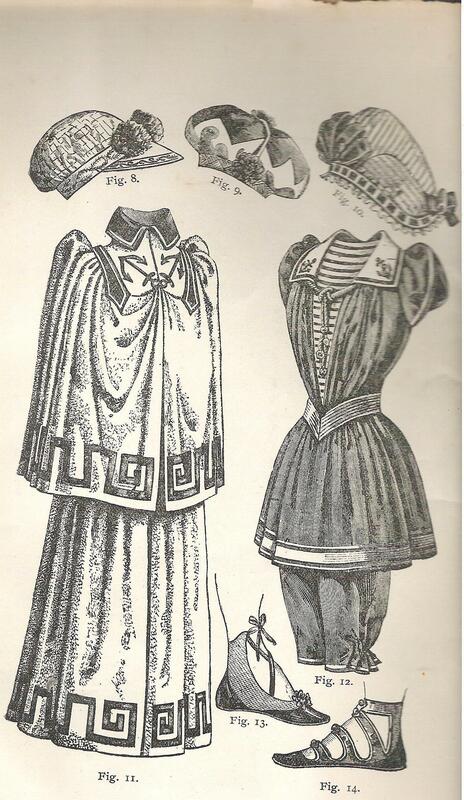 Especially interesting is the bathing cloak, Fig. 11; “These cloaks are always used abroad to conceal the bathing dress when walking down to the beach, and they are now appearing at many watering places, especially the quieter ones. This model is of bath toweling trimmed with a Greek key pattern of navy blue braid, collar of blue linen.” Naturally Lizzie or Emma would not dream of “mixed bathing” with rambunctious males but would keep to the appointed Ladies’ Hours at the beach. Today the Fall River Historical Society has released the working cover art for its long-awaited volume, Parallel Lives, a history of Lizzie Borden’s Fall River. 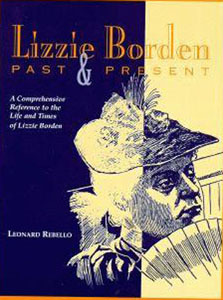 The cover features an expanded view of the famous “pansy brooch” portrait of Lizzie, with her dress tinted in a rich shade of burgundy and was designed by Charles S. Medeiros of Burnt Toast Graphics. It is a rare treat to see colorized photographs of the well-known black and white images so familiar to students of the Borden case. The rich hue used for the dust jacket is one which perfectly reflects Victoriana. 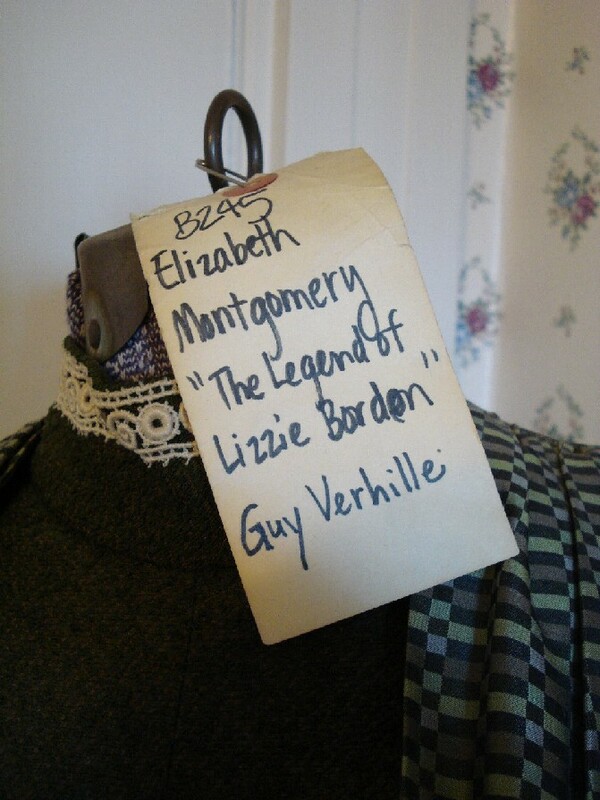 Lizzie truly comes to life. The photograph in black and white featured in the background is of the wedding day of the William Lawton Slade Braytons, June 18, 1913. 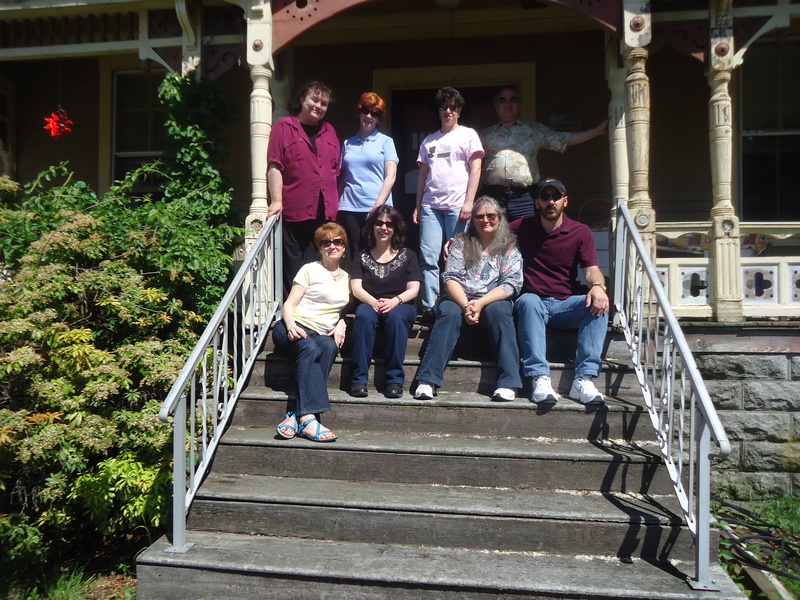 For all the latest on publication date, follow the historical society online at http://www.lizzieborden.org/ParallelLives.html and on Facebook. The volume is currently in final revision with a publication date soon to come- and not a minute too soon for the many eager enthusiasts and historians who are eager for the new photographs of the Bordens and more than 500 photographs in all. It’s always interesting to see where people like to go when they visit this blog. 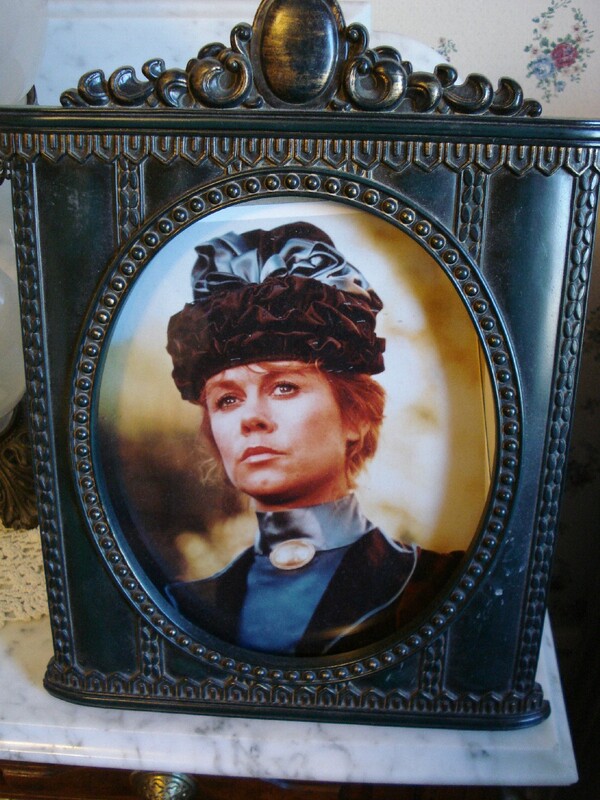 Whether coming across us by accident, or googling another topic altogether, there are many non Lizzie-related posts which are in the top 10 all time “hits” for this blog. Victorian fashion has its share of seekers as well as fans of the 1980 classic romantic film, Somewhere in Time. 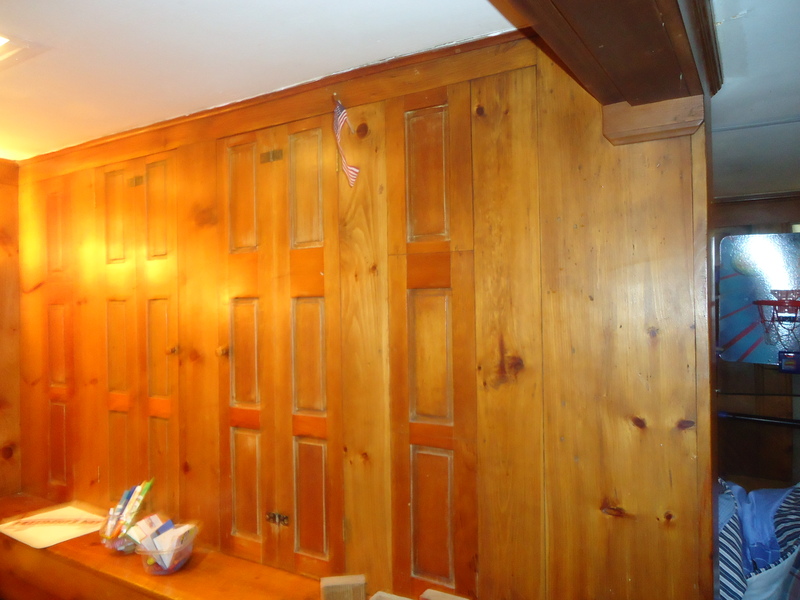 Still, the most visited post is the crime scene of Andrew Borden, with its 360 degree pan of the sitting room. 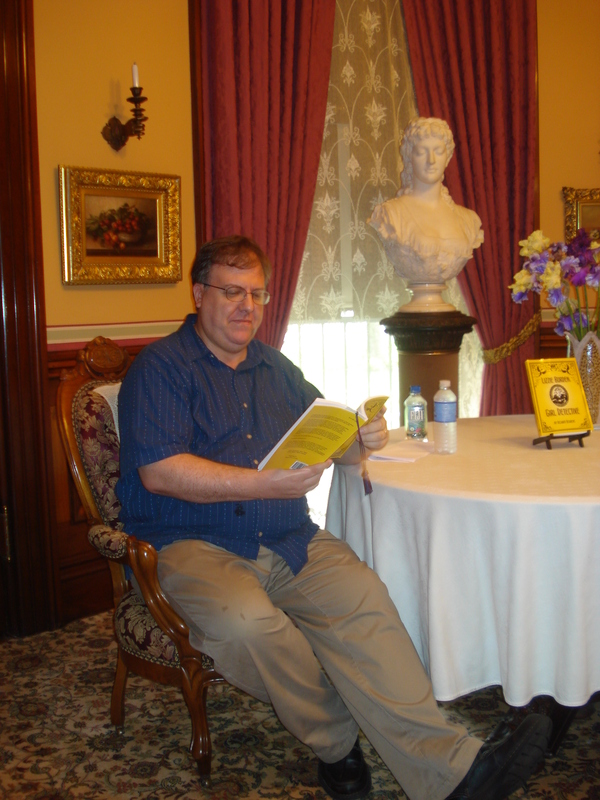 It was a charming June afternoon at the Fall River Historical Society when author Richard Behrens’s treated an appreciative audience to selections from his new book, Lizzie Borden: Girl Detective. 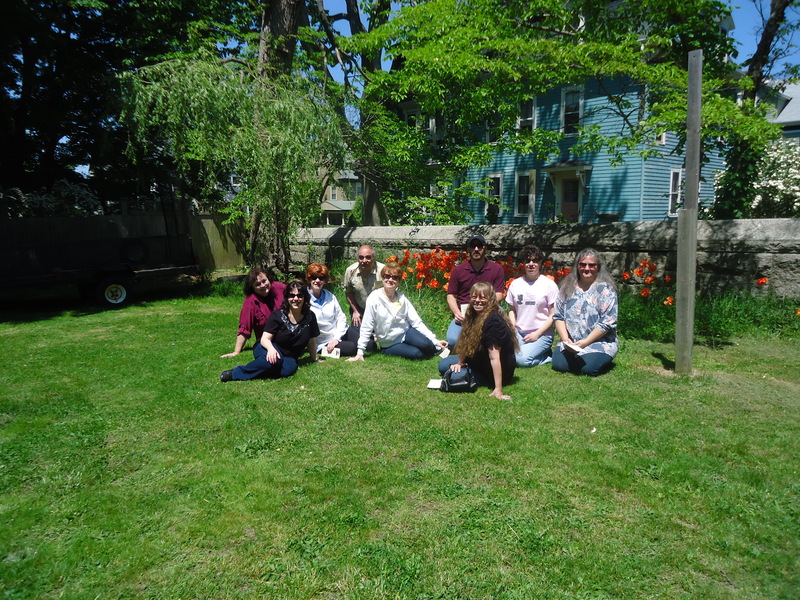 The gardens were in bloom, lemonade and gingersnaps were on the sideboard, and spellbound fans of the latest Lizzie Borden fictional incarnation were held in rapt attention for a delightful interlude. 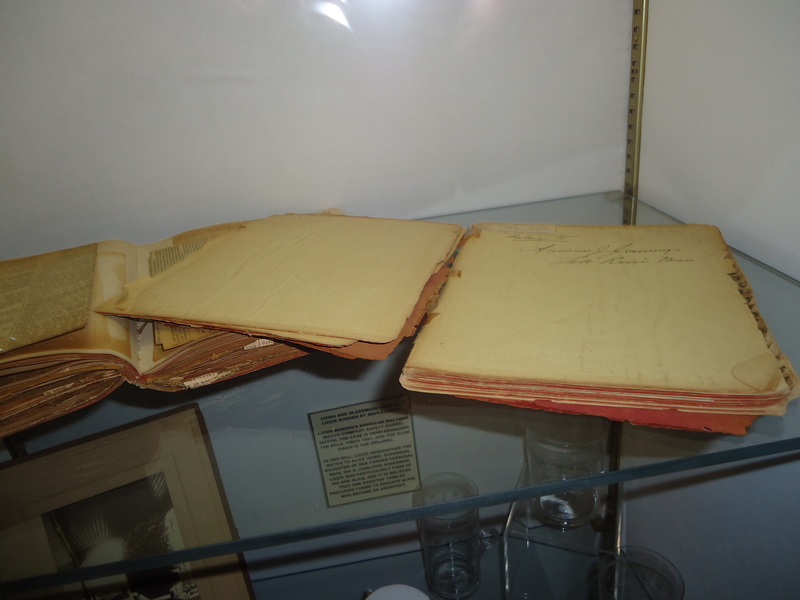 Copies of the book may be found at the historical society or may be ordered through the website (link in right hand column). Thanks to Mondo Lizzie and Youtube for the following videos from this afternoon. 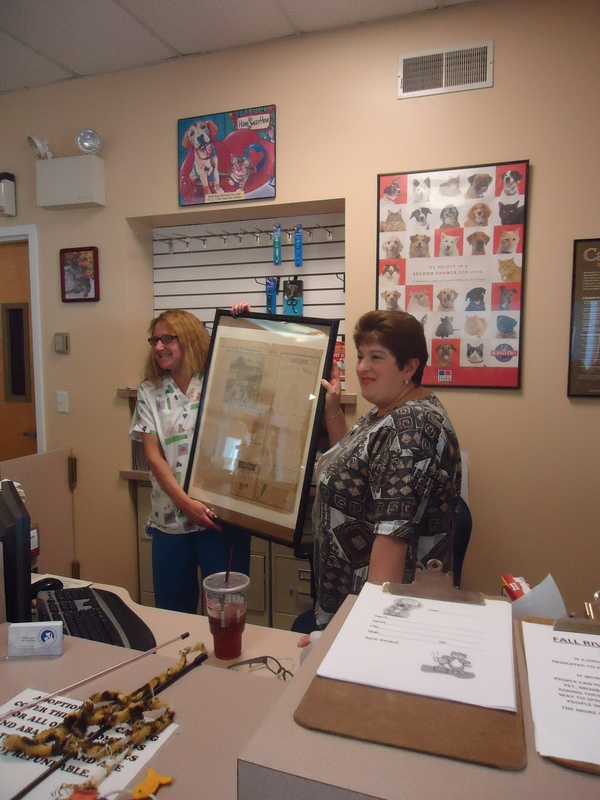 After the visit to the police station, the flock descended on the Fall River Public Library to have a look at the Fall River Room and exhibit of Fall River artist paintings. A happy hour was spent there looking through old street directories, postcards and reference materials-some rare, and all chock full of information about the city. 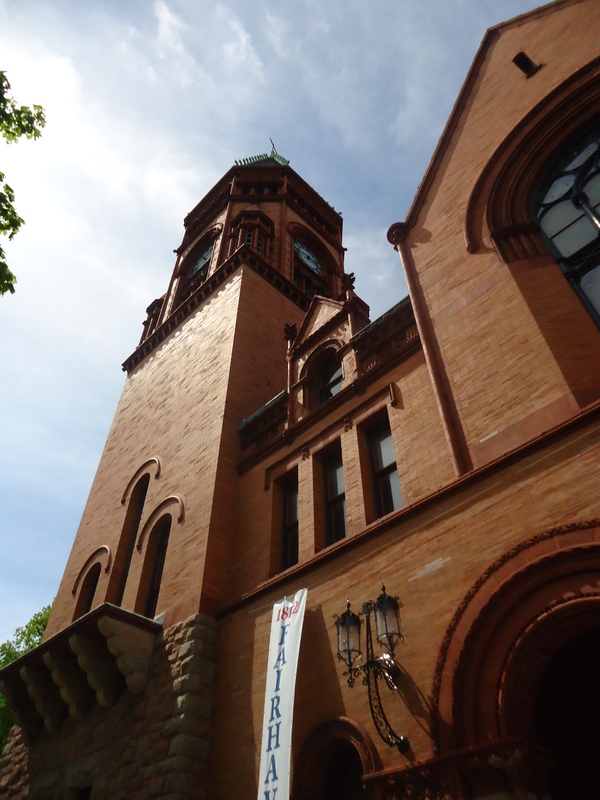 After a tour of the library it was check-in time at #92 Second Street and preparations for the annual banquet, this year at the old Quequechan Club on North Main Street. Some Mutton Eaters opted for vintage clothing. 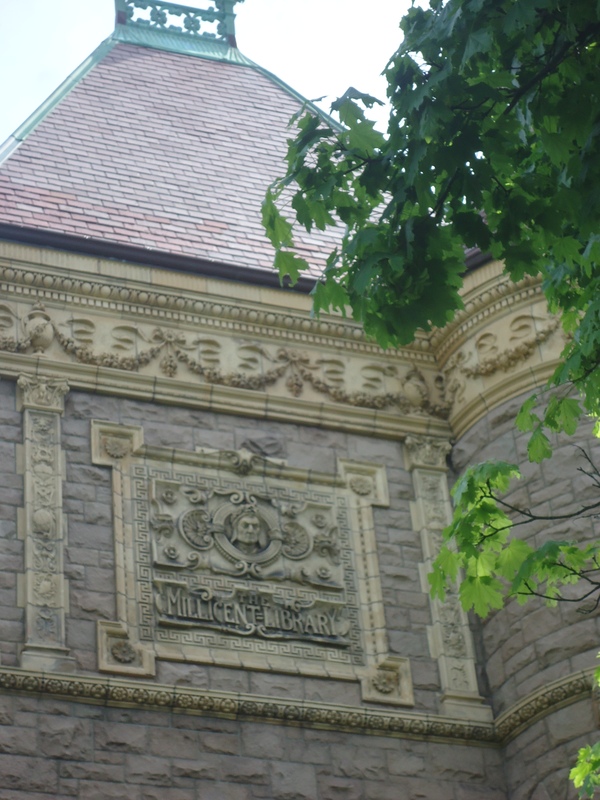 The group handed out awards and enjoyed a superb dinner in the Captain Study on the second floor after taking a tour of the bowling alley and other rooms of the 1894 former gentleman’s club. Dinner was followed by the cutting of the 2010 Cheesecake- a tradition for the Mutton eaters, this year featuring a topper of Lizzie Borden counting dollars instead of sheep in her little bed back on Second Street. It was a late night with lots of singing and presentations by members which included new material on Dr. Seabury Bowen and Sarah Cornell. Laura Loew lives what she loves. 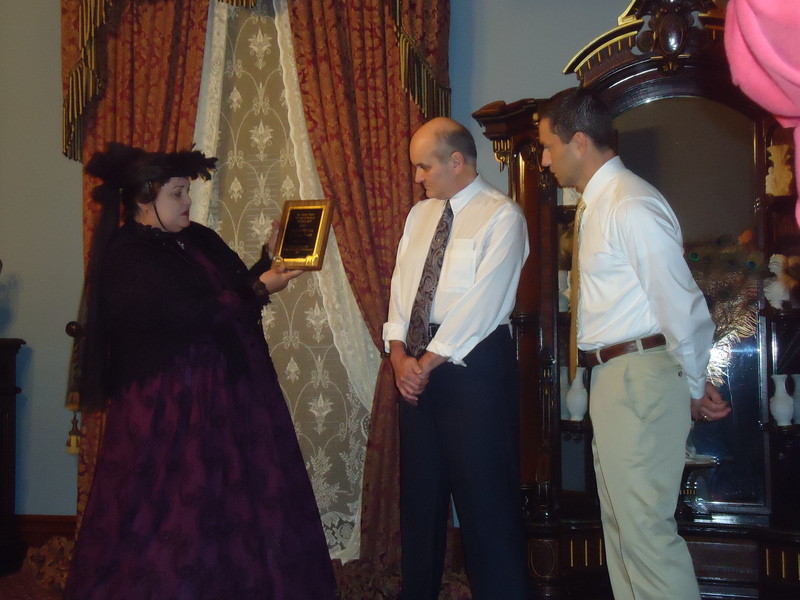 The Medina, Ohio woman offers classes and lectures in various Victorian-era topics including Lizzie Borden, one of the most popular presentations. Ms. Loew presents programs on many aspects of Victorian fashion from hats to needlework to mourning customs including hairwork jewelry. 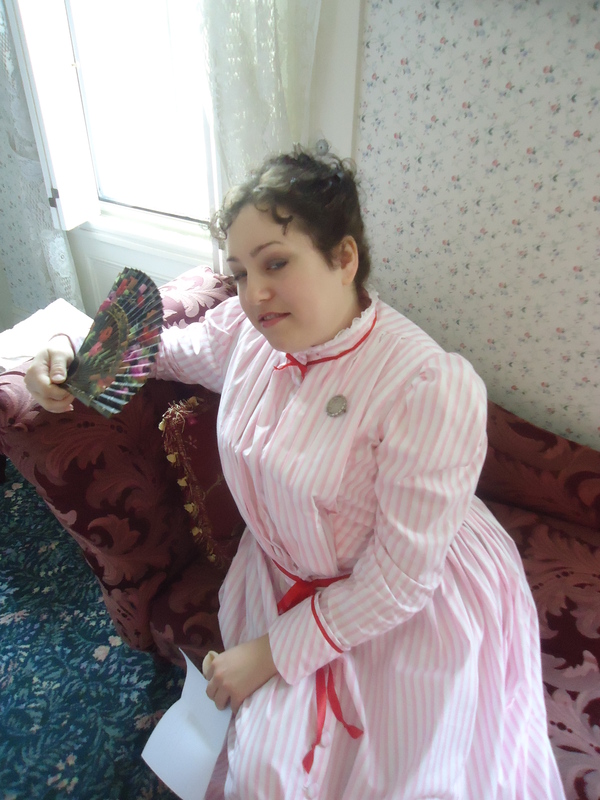 Her company, Lost in the Past, has a web site at http://lostinthepast.com/ where she may be contacted to book a lecture, date a photograph, advise on period costume, plan Victorian teas and myriad other fascinating services related to the Victorian era. 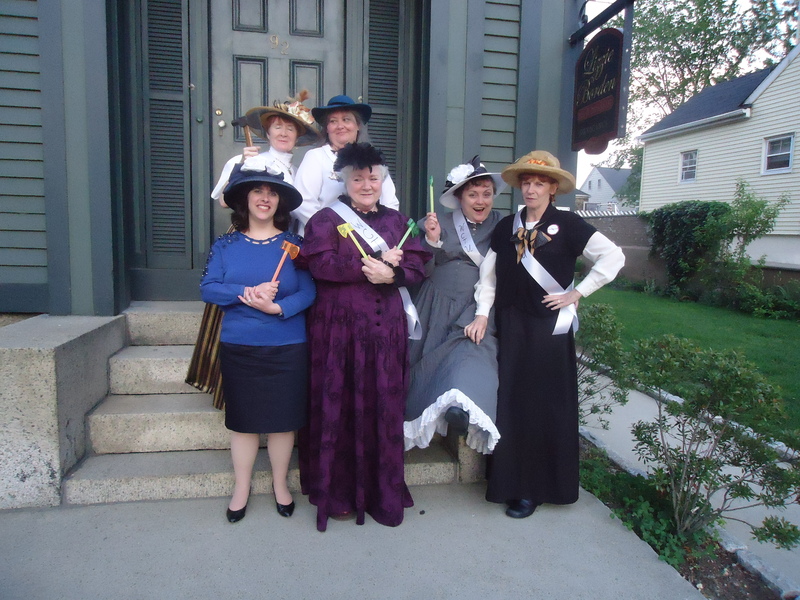 Her next class will take place in her restored Italianate Victorian home and will be a craft session in making a fan, a presentation on the language of the fan, and a tour of her home filled with period antiques on April 10th. Over the decades since Lizzie Borden’s death in 1927, the pansy has become the flower associated with her. She herself never claimed that this was her favorite, and we have only the well-known photograph of her wearing the pansy brooch at her throat as any indication that she liked the flower. Whether it was a favorite of Lizzie’s or merely a favorite blossom of the era cannot be known with any certainty. Postcards, other ephemera, jewelry, household decorations, needlework, painted china, and such are all lavished with pansies. It was a sentimental favorite, probably second only to blue forget-me-nots. Violets, which signify faithfulness, and rosebuds of varying colors were other flowers most often seen. 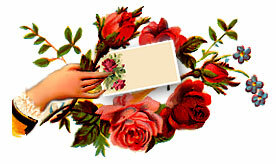 The Language of Flowers was a popular code of the times, of which most ladies were very knowledgeable. Pansies, from the French “pensees” means “thoughts”. Naturally this was an ideal flower to associate with card sending and gift-giving. 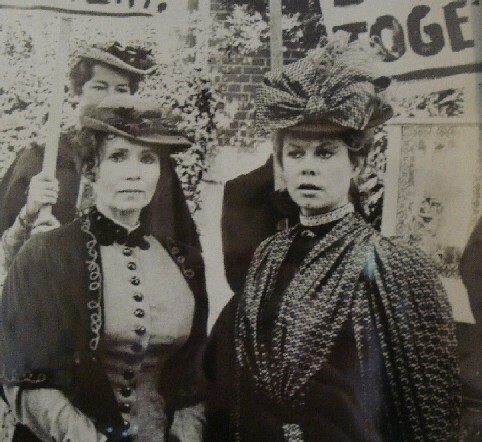 There is a very good possibility that Lizzie’s pansy brooch was a gift given to her by a lady friend of close acquaintance. Lizzie seemed to have a great many dresses in her closet which featured blue, so perhaps the blue-violet shades of pansies appealed to her for that reason. Another well-know name for the tiny johnny-jump up, a diminuative pansy cousin, was “heart-ease”. 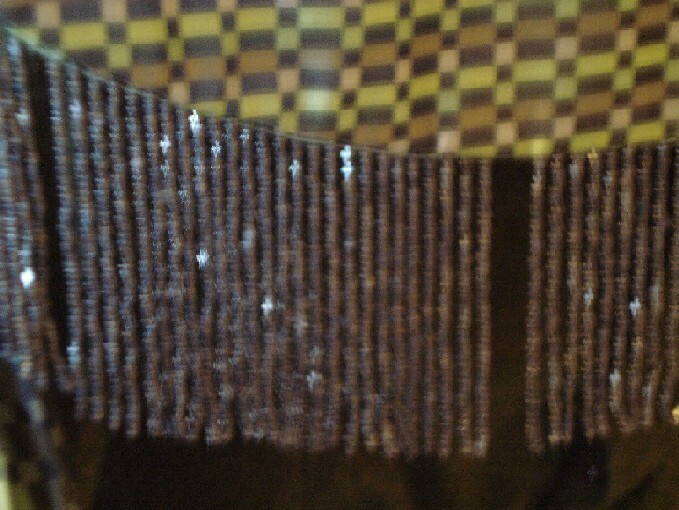 The motif was very popular in handwork for ladies of the time. A lady reporter who wrote about Lizzie’s neat bedroom mentions a pale blue coverlet worked in embroidered flowers by Lizzie. Too bad she did not mention what kind of flowers! Today a vase of silk pansies is kept in Lizzie’s bedroom on Second Street, a Victorian oil painting of pansies hangs above her bed and pansies are always planted in the garden at #92. Here is a poem by Louisa Don Carlos, born in 1874, one of many Victorian verses about the beloved pansy. For pansies are “heart’s ease”. 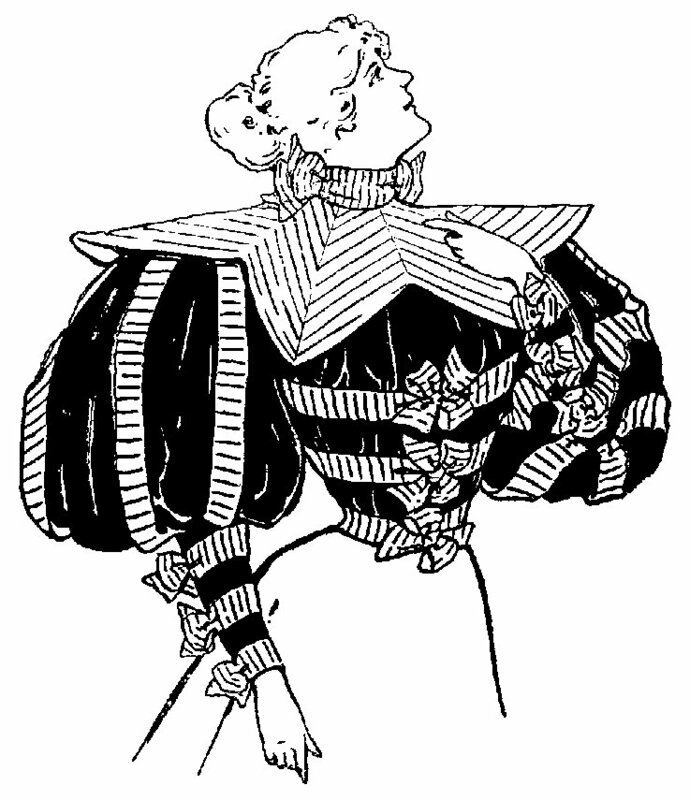 The popular gigot, or leg o’ mutton sleeves continued to grow in size from 1890 until they reached ridiculous proportions by 1898. 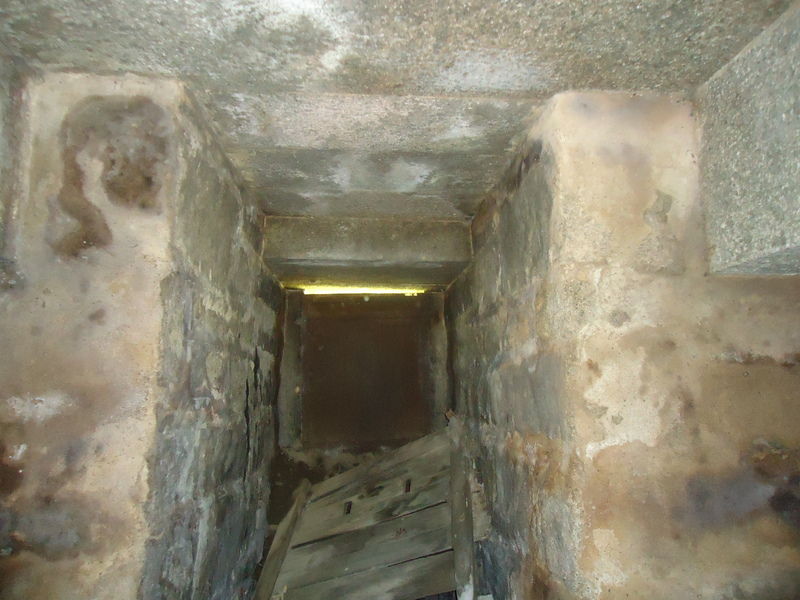 After reaching gargantuan dimensions, there was nowhere to go but down- and they did. 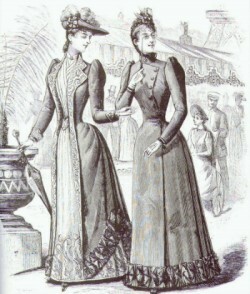 The new Edwardian era changed the emphasis entirely from huge sleeve, hourglass figure, and wide -bottomed skirts to a slim silhouette, monobosom, the “S” shaped curved silhouette and by 1911, a pencil slim hobble skirt which barely allowed a lady room to walk at the bottom. 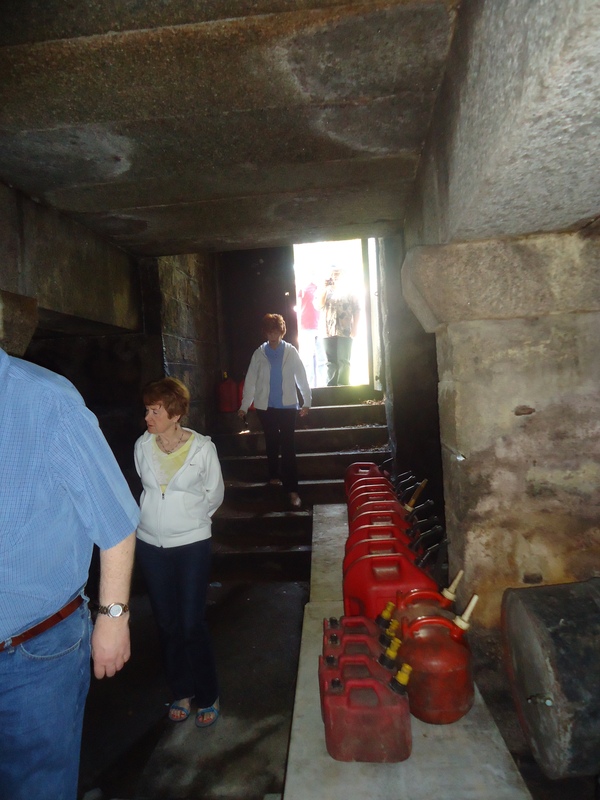 All of that was topped off by monstrous cartwheel hats which were recently glorified in the Cameron film, Titanic. 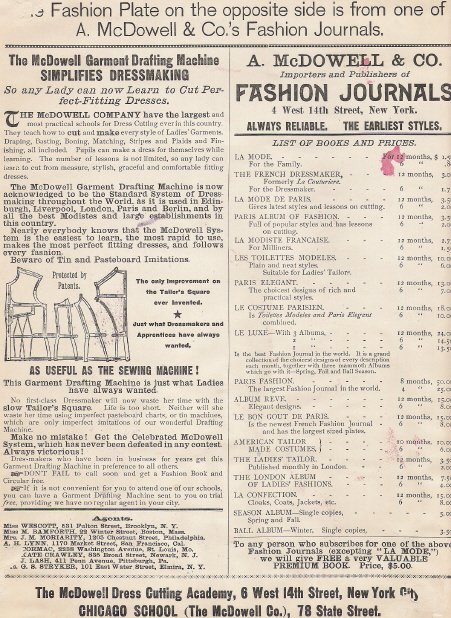 Fresh from the McDowell Dress Cutting Academy Journal in New York- Summer fashions for the seaside. 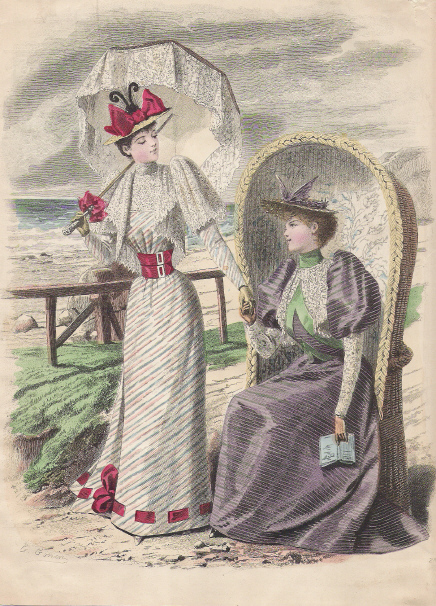 This could have been Emma Borden and her friend Helen Brownell at Fairhaven shore, dressed in some serious leg o’ mutton sleeves. 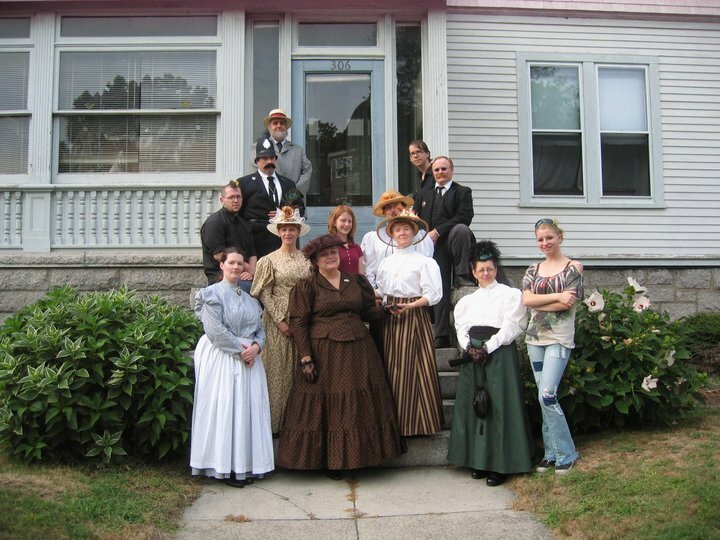 Over the years since 1991, it has been fun to re-live the 1890’s and to re-enact history as part of the cast at the Lizzie Borden Bed and Breakfast. Every August 4th there is a new script and new faces to fill the roles. Before the house was open to the public in 1996, some of us had fun dressing up and giving performances and carriage tours around the city. 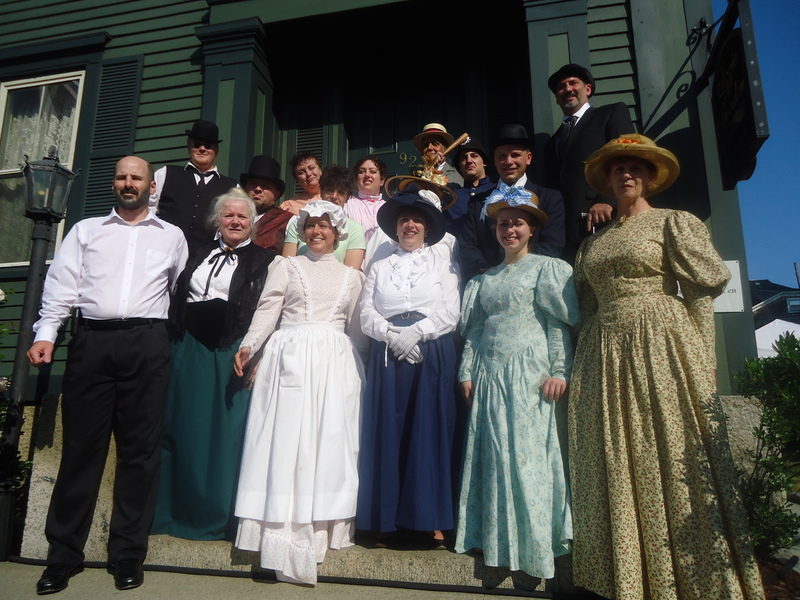 In 1992 the city put on an impressive effort to mark the centennial of the Borden case with Maplecroft open, plays, a Victorian Cafe, city exhibits and a conference at the local Bristol Community College. 1992 may never be equalled. 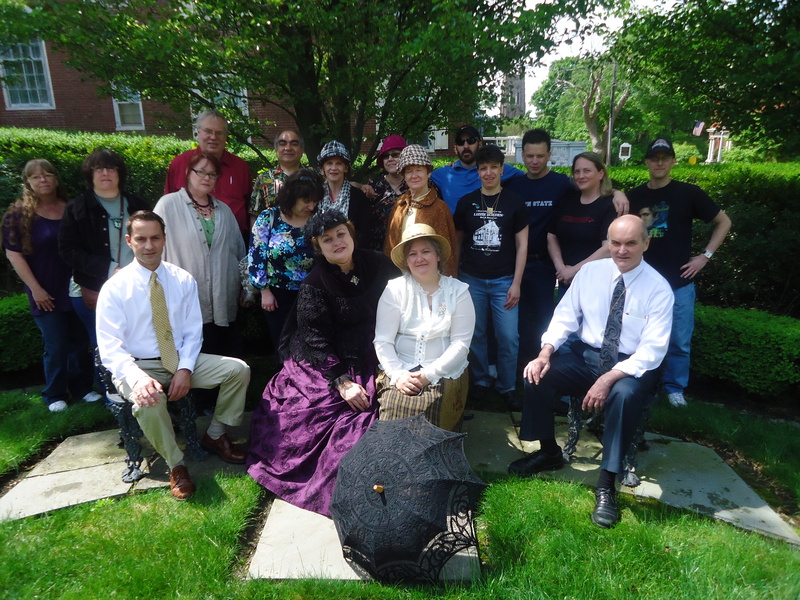 The Second Street Irregulars, a group of armchair sleuths, evolved from the conference as friends were made there who wanted to continue to meet when the centennial ended. 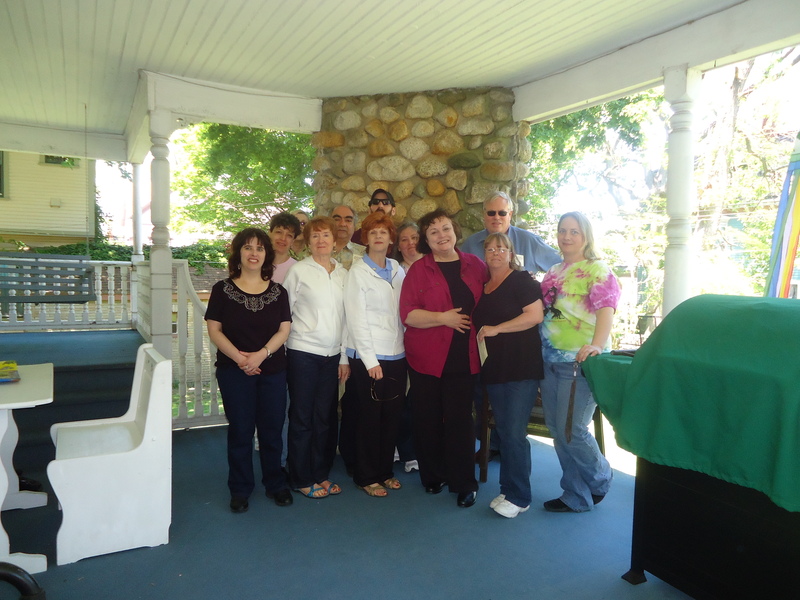 Today the group is going strong again, and meets twice a year to discuss aspects of the case and visit places pertaining to the Borden family and the crime. 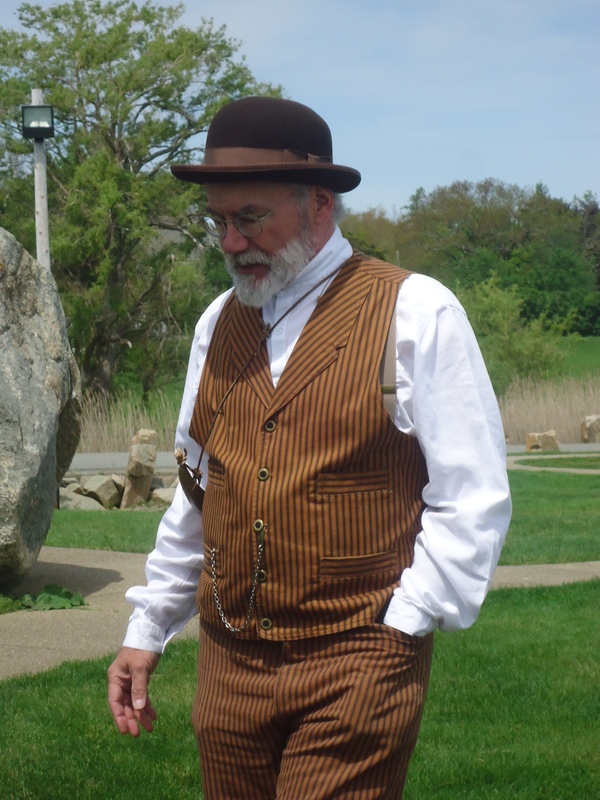 Finding costumes for the past 16 years has been a challenge, but thanks to Butterick and Simplicity patterns, and a new company called Recollections, (see link) dressing the part has become easier. 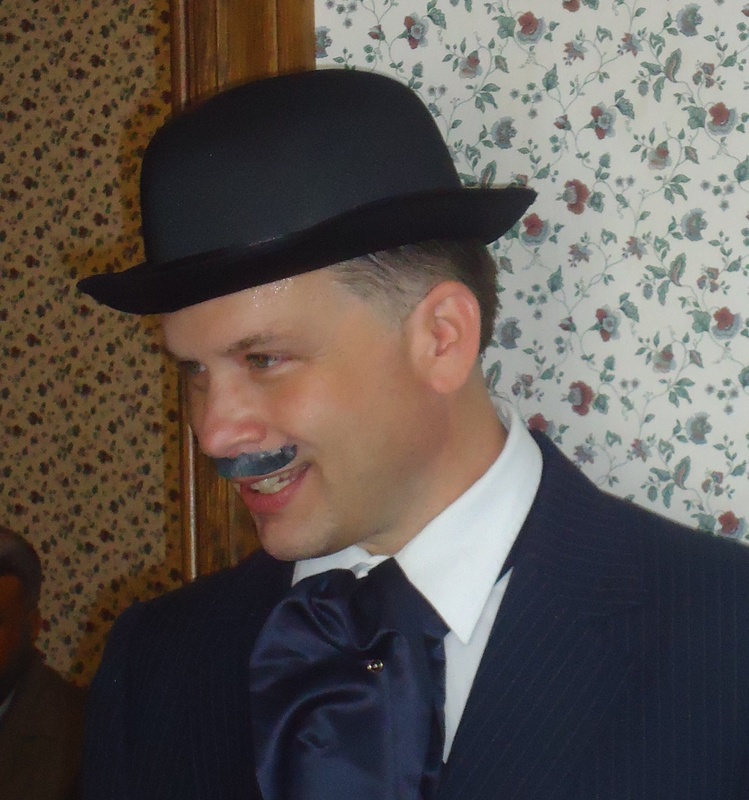 Thankfully costumes for the men are not as difficult, and for many years the part of Andrew Borden has been played by Borden scholar Ed Thibault who has made Lizzie the subject of interest for over 30 years and has worn a black frock coat to great effect! There’s nothing quite like time traveling in a costume with friends who share the same interests with matching enthusiasm. When you ask just about anybody what Lizzie looked like, most will mention her pale, penetrating eyes, heavy lower jowl- and those leg o’ mutton sleeves ! 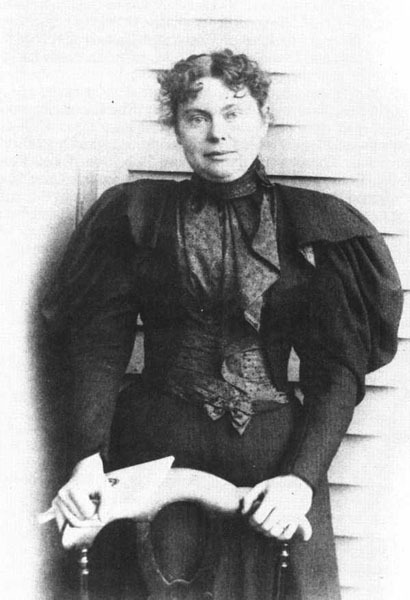 Perhaps it is because the only photo of Lizzie facing the camera was taken on the porch of the Covell house on Farewell Street in Newport after the acquittal.. She has a certain relieved and self-satisfied expression as she gazes right at you, and that Mona Lisa smile is flanked by two enormous leg o’ mutton sleeves. Actresses who are asked to portray Lizzie are always pressed to give the 1893 Lizzie look, complete with leg o’ mutton or gigot sleeves. Surely Lizzie marched on with the trends of the times, and by her demise in 1927, had probably tried out the cloche hat, narrow, shorter skirts, sacque dress and flapper bandeau. For students of costume history, one thing emerges quickly when comparing trends from decade to decade- if the skirt is simple and plain, the bodice and sleeve will be elaborate. 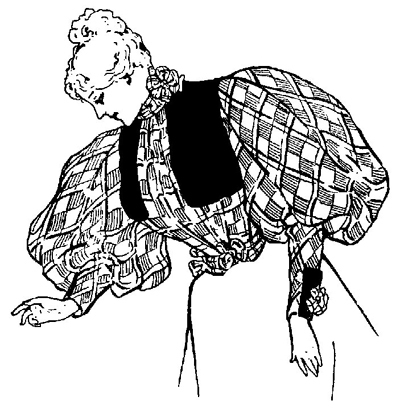 With all the emphasis on the skirt and bustle, elaborate draping of the layers, and passementerie, or trims, the bodice and sleeves were kept plain. 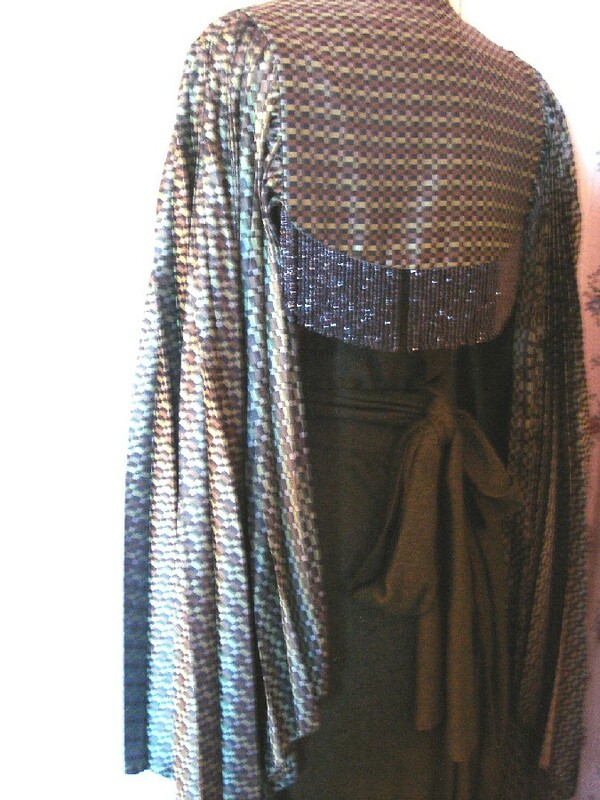 This is sometimes referred to as The Upholstered Age in ladies’ fashion. 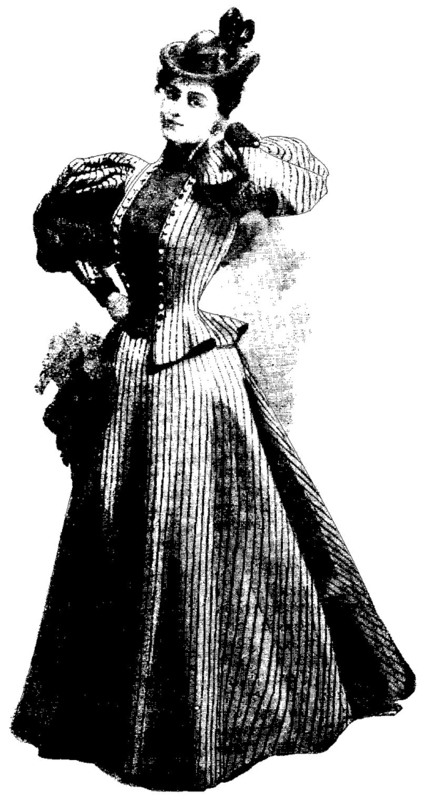 By 1890 things would change again as skirts became smoothly fitted over the hips and wide at the bottoms- made possible by many gores, sometimes as many as 9. These were called bell or morning glory skirts and were a joy to more athletic girls who liked a rousing walk in the country. 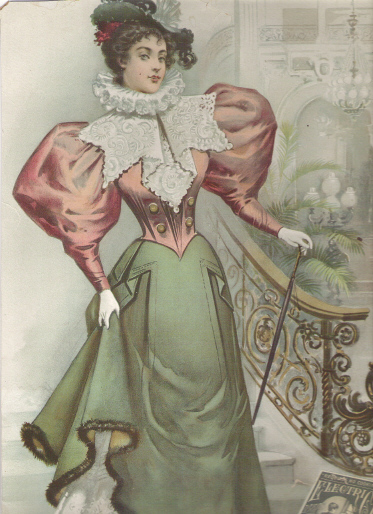 To offset the plain skirts, the top part of the sleeve of the basque or jacket or waist (term for blouse) started to grow and grow into the leg o’ mutton monstrosity of 1896, and then it died a merciful death in fashion. Lizzie kept up-to-date with her expanding leg o’ muttons at the trial, and probably was always aware of fashion’s fickle fancy. 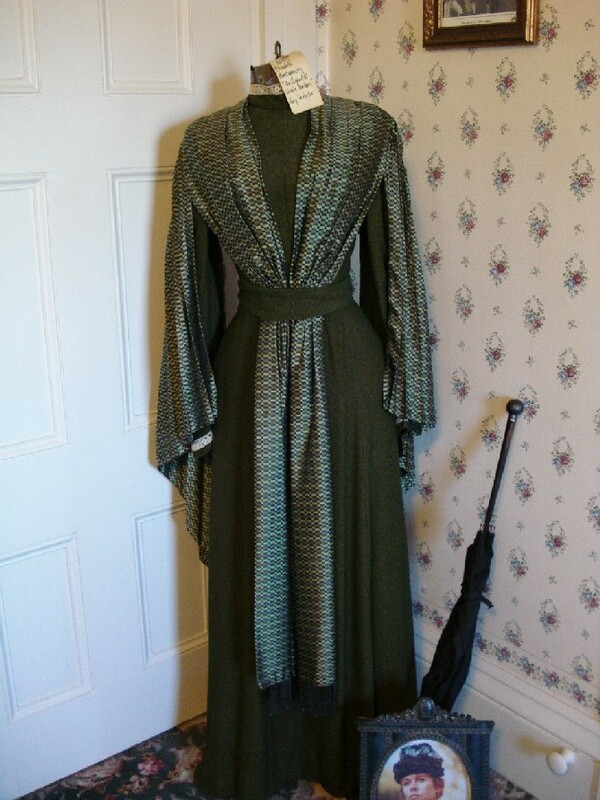 It has been said by some who knew Lizzie Borden later in life that she kept to darker shades, quality tailoring, and the luxurious fabrics which money could buy. 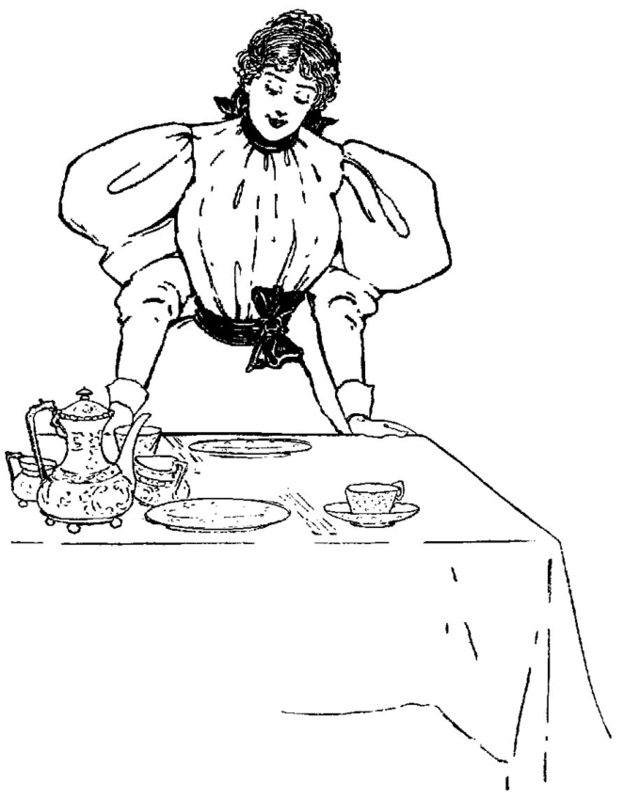 Some of the most revealing images of Lizzie appear in the brilliant newspaper cartoons and sketches found in various newspaper coverage of her 1893 trial. 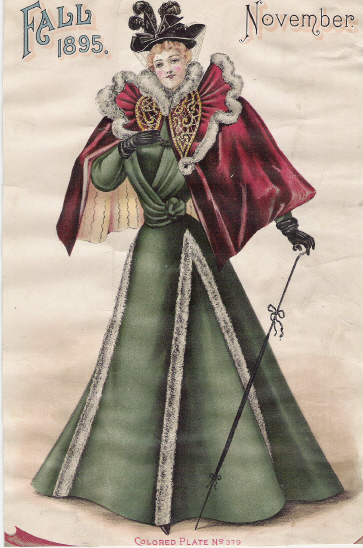 The description of items in her dress closet and observations made by others as to the neatness of her dress reveal a lady who knew what was fashionable. She may not have possessed a closet filled with Worth ballgowns, but she certainly knew the latest styles in headwear and sleeves. 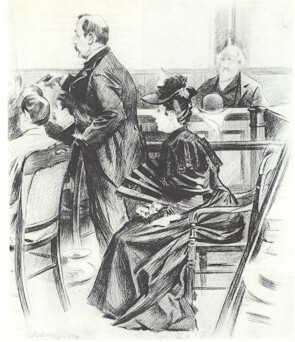 The “chip hat” shown here in a trial cartoon used on the cover of Lizzie Borden Past and Present was all the rage in 1893. Hats had to accommodate the bun of back hair or elegant French twist seen in this flattering image. Although the hat does have the look of a “chip” with the back end tilted upward, chip actually refers to a machine made summer weave. The best plaited weaves of straw or thin willow wood came from Italy. “In the valley of the Po River in northern Italy grow slender willow trees. From these trees are made chip braids—the only wood braid that is used to any extent in millinery. The young tree is split into sections, planed smooth and cut into fine strips. When these strips are planed off, a thin chip is formed. The embellishment on hats of this period tend to be on the strong vertical line and toward the center to front of the hat: feathers, bows, birds and fruit often being the trims of choice.